Muslim-Phobia on the Rise in the US? A few weeks ago I was working on a story about Ramadan and Muslims in the Bay area, where I live. I was surprised by some of my findings during the research and interviews, in particular the increasing concern about practicing religion in public and being identified as a Muslim in some communities. I am getting sick of my editors assigning me to cover anything connected to Muslims and the Middle East, because it doesn't allow me to explore other areas and environments. However, this turned out to be quite an interesting experience. Almost all of the men and women I talked to, whether in mosques, metro stations or even on the UC Berkeley campus -- which is well known for its multicultural environment -- told me they find it difficult to practice Islam. Very few of them wore scarves or other kinds of Hijab, and they said they felt pressure from their environment to avoid clearly identifying themselves as Muslims by praying in their work places, reading the Koran, or wearing clothing that might mark them off from others. They also mentioned that they think people's prejudice against Muslims has greatly intensified since September 11. Many of the people I talked to initially thought I was a Federal cop and didn't want to talk to me. I could feel the anxiety my presence aroused when I arrived at a mosque in Oakland, California with a notebook and a pencil in my hand. One of the people praying asked not to be photographed and a few others refused to talk to me. The director of the Islamic Cultural Center of Northern California (CCNC) told me that he has seen a decline in attendance since September 11, because some people are worried that if they are associated with an Islamic Center, there will be repercussions. "If later on some government entities come and want to investigate this issue, they are afraid to get into trouble or maybe something would happen to them," he added. My interviews with people praying in a few mosques in Oakland, plus airport stories that has become a stereotyped during the last years and all my personal observations, even my experiences on the Berkeley campus although can not be generalized as a whole but shows a serious trend. The information I received in my interviews, paired with my observations and experiences whether on the UC Berkeley campus, at airports, or at a mosque, indicate a general fear and misunderstanding of Muslims" on one hand, a fear of practicing Islam freely on the other hand. A survey released by Pew Research Center on September 20 2007, also, confirms that public attitudes about Muslims and Islam have grown more negative in recent years. "About four-in-ten Americans (43%) say they have a favorable opinion of Muslims, while 35% express a negative view. 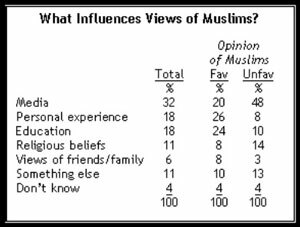 Opinion about Muslims, on balance, was somewhat more positive in 2004 (48% favorable vs. 32% unfavorable)," says the report. "As in previous surveys, Muslim Americans are seen more positively than Muslims (53% vs. 43%); however, unfavorable opinions of Muslim Americans have also edged upward, from 25% in 2005 to 29% currently." I believe the unfavorable opinion about Islam and Muslims are heavily influenced by skewed media coverage. Americans should take this issue seriously and raise their concerns about creating a new kind of polarization, marginalization, and discrimination. This country was based on freedom of religion, and it is very ironic that after 300 years, we are facing with a sort of religious discrimination, consciously or unconsciously!